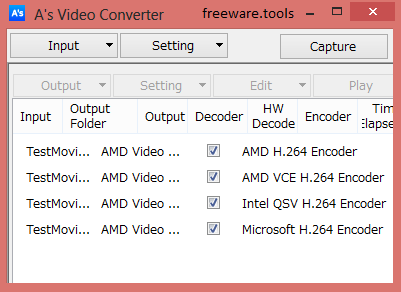 A's Video Converter is a portable tool designed to utilize GPU encoding and decoding, supporting AMD, Intel and Microsoft technologies. A's Video Converter's GPU assisted decoding supports DXVA, AMD UVD and Intel Hardware (Sandy Bridge/Ivy Bridge), while its GPU assisted encoding supports AMD APP, AMD Video Codec Engine (VCE) and Intel Quick Sync Video (QSV). GPU filter support accommodates DXVA and Intel Hardware. In addition, A's Video Converter also includes a simple movie editor, as well as the ability to batch convert and convert up to 8 files at once. The utility can be run immediately after decompressing the archive, as its installation is not necessary for it to function properly, provided that its prerequisites are met. The clean and simple user interface that Portable A's Video Converter displays will pose little problem, even to less computer-savvy individuals. In order to get started, you first need to load the movies that you want to process; this can be done either one item at a time or by opening a whole directory at once. However, make sure it only contains videos, as the program does not discriminate between formats and will load all the comprised files. Portable A's Video Converter comes with a built-in media player and editor, which enables you to view as well as modify various aspects of the movie. From the ‘Transcode Settings’ section, you can alter several audio and visual configuration options, or you can resize, crop, deinterlace and change the frame rate of the file. The program also allows you to modify the destination folder as well as the ‘Audio Index’ and the ‘Audio Delay’. Both the audio and the video can be converted, or you can simply export the audio stream from a movie. To conclude, Portable A's Video Converter is a useful and easy to understand application that you can resort to whenever you wish to turn movies to other formats or extract the audio from a video file.